In a multi-phased redevelopment in the Town of Harrison, Harrison Station 330 is the second building in the creation of a new town center. As directed by the community’s Waterfront Redevelopment Plan, Harrison Station provides a modern pedestrian-friendly transit oriented development (TOD) that emphasizes environmental responsibility and community connectivity. 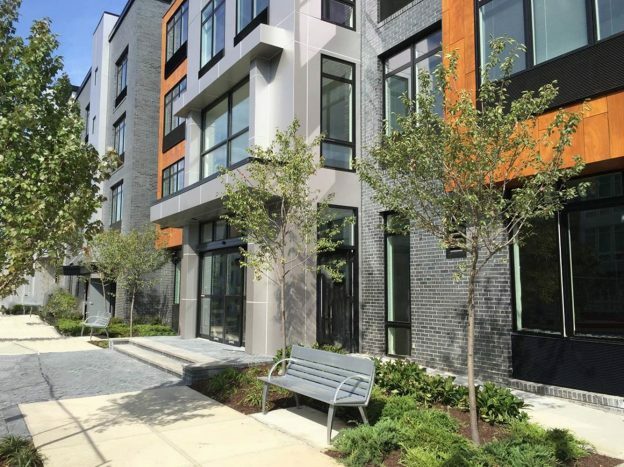 Located a block from the existing Harrison PATH station, Harrison Station 330 represents a visionary example of transforming an under-utilized environmentally contaminated site into a gateway community for modern urban living, shopping and working. Historically, the Harrison Station site had been strictly used for industrial and warehouse uses. The project aesthetic provides a nod to the brick skeletons of its industrial past yet showcases contemporary architecture. In that respect, Harrison Station’s façade breaks away from the flat industrial factory fronts and adopts projections and recesses that play with light and shadow. The exterior materials include a playful yet modern mix of brick colors, metal panels and composite panels with a wood grained finish. The rental units address a modern lifestyle trend with open floor plans that provide a loft-like living experience. As a commitment to sustainability, the project’s lighting, appliance and plumbing fixtures are also Energy Star compliant. This entry was posted in Low Rise, Mixed Use, Multifamily/Residential, Transit Oriented on May 3, 2016 by Melissa Thomson.